I have many wonderfully crafty friends, but there are a few people in my life that I consider true artists. My friend Toby is one of them. She hand-selects items from all over-- thrift stores, antique shops, Ebay-- and combines them into something amazing. A few months ago she gave me the great privilege of photographing some of her stunning jewelry creations and helping her design a banner for her brand-new Etsy shop. I have a newfound respect for catalog photographers because capturing jewelry in interesting ways isn't easy, but now that her shop is up I am so excited to show them to you! Her pieces are a funky mix of genuine vintage details with steampunk charm (don't worry if you don't know what steampunk is... I had to google it too) and the effect is always a show stopper. Toby's necklaces are guaranteed to be a conversation starter because they are simply one-of-a-kind. No one else in the world will have one quite like it. Click on any of these pictures to be taken to the actual Etsy listing. This one is called "Flower Garden" and includes a genuine 1912 dogtag from Rathrdum, ID. I think that's such a fun detail since Rathdrum is a local town for me. I love that her pieces all include so much detail but you really have to search to find it all. 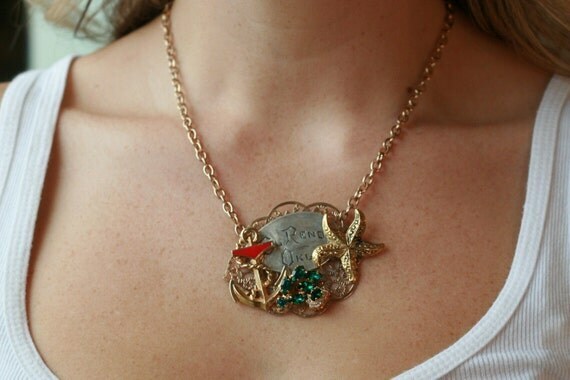 This adorable "Franklin" necklace includes an antique typewriter key with a little kiwi bird perched on top. Too cute. Nautical theme, anyone? How great is this with summer coming? This one is my absolute favorite. I just find the white rose against the key to be stunning. It has three beautiful little crystal charms on the chain that add a touch of sparkle. I love it. And my birthday is in three weeks. Is anyone listening? That's just a sampling of the gorgeous one-of-a-kind necklaces Toby has designed. I've already heard a lot of buzz about them on Facebook, so if you're interested, I suggest you visit Honeysuckle Design on Etsy and snap 'em up before they're gone! Those are gorgeous! I will have to check out her site. Wow! Her work is exquisite! And you did a fabulous job with the photography. I really struggle with that part of marketing. P.S. My birthday is in 4 1/2 weeks. P.P.S. I'm just getting ready to start some mindless reading of PW's book, freshly checked out from the library. Preparing for lots of LFR. Melissa~ your comment made me LFR. Not sure exactly why. Maybe all the P's and S's. I can't wait to hear your review of PW's new book. Her sense of humor just tickles my funny bone.